A demonstration over identity cards at a Rohingya refugee camp in Bangladesh in April, 2018. Image: NurPhoto/SIPA USA/PA Images. In 2016, Nural, as a leader in a Rohingya village in Rathedaung, was called to a meeting by a high-ranking officer from the Myanmar Border Guard Police. There, Nural and the gathered village leaders were told all Rohingya must now accept identity cards, known as nationality verification cards (NVCs), or they would “no longer be allowed to remain in the country” and be “driven out”. Despite the risk of speaking out, Nural raised his voice in the meeting, “These NVC cards make us into foreigners who are supposed to apply for citizenship. We are already citizens of this country.” In his frustration and anger, he pounded his fist on the table three times. Four armed officers pointed their guns at his head, escorted him out of the room and handcuffed him to a chair. Fortunately, he was not among the 30 men who were arrested in the village that day. He was not the man who was shot dead while running away from the guards that came searching for his father-in-law. He was not the man who was sentenced to seven years in prison, or the one who was blinded in one eye by police beatings. His village escaped being burnt that day – only to be razed a year later. Nural is only educated to primary level, but he knows well the history of his people. He knows his Rohingya forefathers have resided in the north Rakhine region centuries before the Burmese generals in power now, who are Johnny-come-latelies by comparison. He knows that his parents and grandparents carried the same citizenship cards and had the same rights as all other citizens of independent Myanmar. And that Rohingyas’ proof of citizenship and belonging has been systematically removed over the past thirty-five years through the confiscation, destruction, nullification, and targeted non-issuance of documents, all carried out by multiple civilian and military agencies under a single command. He is sure that NVCs are just the latest in a long-line of ID cards that attempt to recategorise Rohingya as foreigners, attack their group identity and remove their rights. In all Rohingya communities, village chairmen and yar ein hmu (leaders of 100 households) like Nural were ordered to accept the cards. They were told if they did not, they would be dismissed from their positions and punished under the law. Some held out – others could not. Nural tells me with pride that his was one of eight villages in Rathedaung that stood united against the NVCs. He, himself, held out. He was just one of many Rohingya who resisted the destruction of their identity as a group indigenous to the Rakhine region by refusing the cards. Now, after having fled across the border into Bangladesh, Rohingya are facing a new chapter in their struggle against identity cards. But this time threat is coming from an unexpected source – the United Nations refugee agency – who have proposed a form of documentation which Rohingya claim is almost identical to the cards imposed by the Myanmar state. Between 2016 and 2017, villages were subjected to night-time “security” raids which villagers say were linked to the NVC cards. One man described with tears of anger and sadness that his older brother died after being bitten by a snake while hiding in the forest one night. As the men hid, they left behind women and girls who were repeatedly subjected to sexual violence at the hands of the security forces. “I cannot even speak of what happened to our women, while we hid.” he said.Across ten focus groups and multiple in-depth interviews, I have been told that without the NVCs, school children were not allowed to sit for final examinations, fishermen could no longer fish, cattle traders could no longer go to market, businessmen could no longer pass through checkpoints, parents could no longer register the births of their children, prisoners could not be released at the end of their sentences, sick people could not go to the hospital, and retirees could no longer draw their salaries. It became barely possible to eke out a living, support a family or survive. The attempted enforcement of identity cards was, and still is, aiding, what the Indian philosopher Amartya Sen has described as, a “slow genocide” in Myanmar. But still communities hold out. Rohingya accounts of the enforced issuance of NVCs are full of heroism, tragedy, unity, pride and occasionally shame, where they could no longer endure. The attempted enforcement of identity cards was, and still is, aiding the “slow genocide” in Myanmar. In focus groups, I have often heard NVCs refered to as "genocide cards" by Rohingyas. Following the outbreak of violence in August 2017, the vast majority of Rohingya fled their homelands; many were killed or driven out of the country by terror, their homes burned, and their lands stolen by the state. A nationality verification process, originally (and sometimes still) promoted by international agencies as “a pathway to citizenship” for “stateless” Rohingya, has compounded the physical, symbolic and cultural destruction of a group. 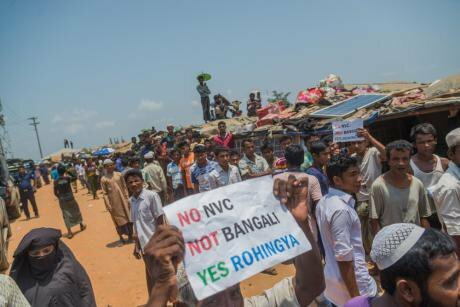 Unsurprisingly, the 800,000 Rohingya in Bangladesh’s refugee camps are insistent that among their conditions of return to Myanmar is the end of NVCs or NVC-like procedures.¹ They are demanding an end to being labelled “Bengalis”, “foreigners” or “stateless.” They want their citizenship to be recognised and to be called by their own name, Rohingya, as an indigenous group of Myanmar. It is not simply a matter of access to citizenship rights. It is also a matter of safety, security and survival. Displaced Rohingya are also uniting in their resistance to another kind of ID card – the “smart cards” being issued by the United Nations High Commissioner for Refugees (UNHCR). Despite a deep and tangible yearning to return home, they are resisting premature or forced repatriations by refusing to accept UNHCR-issued biometric “smart cards”. These cards are being issued following the memorandum of understanding between the UNHCR, the United Nations Development Programme and the Myanmar government relating to repatriations to Myanmar. Although the UNHCR and the Bangladesh government claim the cards will not lead to immediate repatriation, Rohingya are understandably wary. The UNHCR are in a predicament. Without issuing cards, they struggle to “be operational.” But Rohingya are resolute in their rejection – operations or not. A demonstration during a UN Security visit at a Rohingya camp on 29 April, 2018. Image: NurPhoto/SIPA USA/PA ImagesOn a visit to a refugee camp in Bangladesh to ask people about citizenship in Myanmar, not smart cards, it soon becomes apparent that the two are linked. The small crowd that gathers around me as I sit in a small open-air shelter steadily grows as the conversation moves on to smart cards. “Please do something about the smart cards, please”, one young refugee begs of me. Reports have been circulating for several months among the camp population that there may be shadowy organisations offering 500 Bangladeshi Taka to each family willing to break ranks and take the cards, or that beatings by security officers taking place outside the UNHCR office are doled out for those that refuse. There’s buzzing concern and a subdued sense of confusion and betrayal that a group of residents in another camp have reportedly accepted UNHCR’s smart cards. In almost all of my conversations with refugees over the past two months, the issue of “smart cards” has come up as a major concern related to safety and security on return to their homelands in Myanmar. So, what’s wrong with the cards? Firstly, Rohingya are asking that they be recognised on the cards as “refugees”, a term the Bangladesh government is reluctant to entertain fearing it will contribute to the protracted nature of the Rohingya refugee issue in Bangladesh. For Rohingya, whose family and oral histories are ingrained with accounts of repatriations at gunpoint over the past 40 years and the confiscation, destruction and nullification of the documents that prove their citizenship on return, the term “refugee” offers some degree of international protection. It also offers proof that they crossed from their home in Myanmar. Myanmar has labelled past returnees “Bengalis” and the UNHCR, who has presided over the monitoring of returnees in the past, has been powerless to prevent further abuses. Refugees are insisting that the UN refugee agency cards carry the term “Rohingya”. Secondly, refugees are insisting that the UNHCR cards carry the term “Rohingya”, running contrary to the agency’s practice of not stating ethnic identities on ID cards, lest it result in discrimination. Rohingya demands for recording their identity as a group indigenous to the Rakhine region of Myanmar, relate not to international practices but to practices within Myanmar in which the only variety of citizenship worth having is one based on the membership of an ethnic group considered by the state to be pre-colonial or indigenous – one recorded on all documents. Since these refugees have been targeted for no other reason than their membership of a group, Rohingya understand that the public acknowledgement of their ethnic identity by the Myanmar state is absolutely essential in halting and preventing the ultimate crime against a group, genocide. Thirdly, and most significantly, Rohingya repeatedly state that “the smart card is the same as the NVC card”. They have an important point here – smart cards may well not be so different from NVCs in terms of outcomes. All biometric and biographical information handed over to the UNHCR will be shared with the Myanmar government in the event of repatriations, and this can then be used, to produce the identification cards issued by the Myanmar state. But much more importantly, as one bright young refugee explains, jabbing aggressively with his finger at clause 15 of the leaked MOU between UNHCR, UNDP and Myanmar on repatriations, the agreement states after Myanmar has carried out the “necessary verifications” they will issue “appropriate identification papers” and provide a “pathway to citizenship to those eligible”. In short, the ID cards issued on return, using the data from the UNHCR smart cards, will either be NVC cards or something very similar, that require Rohingya to have their nationality verified by a government that has systematically removed evidence of their citizenship and evidence of Rohingya existence, as part of a 40-year genocidal process. If returnees are lucky, or perhaps unlucky, they may be provided with a citizenship document that labels and stigmatises them as “Bengali” – but certainly not “Rohingya”, not indigenous and not entitled to the same rights as other citizens. What is even more problematic for Rohingya is that the UNHCR along with other international agencies have since the 1990s promoted “pathways to citizenship” as the way to resolve what they have historically understood to be Rohingya’s de jure statelessness. The “temporary registration cards” or “white cards” issued to Rohingya from 1995 onwards, during the UNHCR’s time in the Rakhine state, gave material form to the international rhetoric that Rohingya were “stateless”. One high profile camp-based Rohingya activist claimed, “when UNHCR told us to accept these white cards in Myanmar, they effectively labelled us as stateless.” Since they had citizenship before the 1982 citizenship law, under the law, they should still be entitled to it. Rohingya across five countries find the label “stateless” hurtful and harmful. Rohingya across five countries, have consistently told me how hurtful and harmful they find the label “stateless” as, for many, it suggests that they have never been recognised as citizens. “Pathways to citizenship” is generally a way for international agencies to mediate between a neglectful state and undocumented people. It is perhaps less appropriate in a situation of genocide with the wilful denial of the rights and the existence an indigenous people. “The good news”, I tell the young guy angrily prodding a copy of the MOU, “is the UN Fact Finding Mission report is the first UN report that does not call you de jure stateless, but de facto stateless. Just like any other refugee in the world. They recommend the reinstatement of your full citizenship.” His smile flickers, but he doesn’t appear reassured. We can only but hope that the change in discourse brought by the FFM report, which also describes the Rohingya persecution as “genocide”, will help to finally bury the idea of NVC cards as part of a solution for Rohingya. In the refugee camps, it is hard to miss the simmering anger and indelible mistrust of the UNHCR for its inability to ensure voluntariness, safety and rights during two previous rounds of forced repatriations in 1978-9 and 1993-4; and for its lack of refugee consultation and transparency in negotiating the conditions of potential Rohingya returns this year. Promoting smart cards for genocide survivors, as though ID cards can provide a neutral record of external facts about human beings, just isn’t going to wash this time. As one Rohingya political leader told me, “it is impossible for the UNHCR to ensure repatriations if they cannot even issue the smart cards on a voluntary basis.” It’s time to stop talking about “pathways” – treacherous as they have been for Rohingya – and to start listening to Rohingyas’ own understandings and interpretations of how the genocide has played out, including how they feel about the “genocide cards” and “smart cards”. Rohingyas know the significance of these cards, more than anyone else, UN included. The survivors voice must carry the greatest weight. *Names have been changed to protect interviewees. ¹ See also the UN Special Rapporteur report on Human Rights in Myanmar for conclusions regarding National Verification Cards. ² Some Rohingya media has reported the beatings.